Being the best she can be. She has been called tough, resilient, determined, a superwoman and funny but to me she is best known as my best friend and childhood pal. Valeska Roxanne Luckert was born on the gorgeous island of Curaçao in the Dutch Caribbean. At the age of three she moved to St. Maarten where her father who was then in government was transferred to. 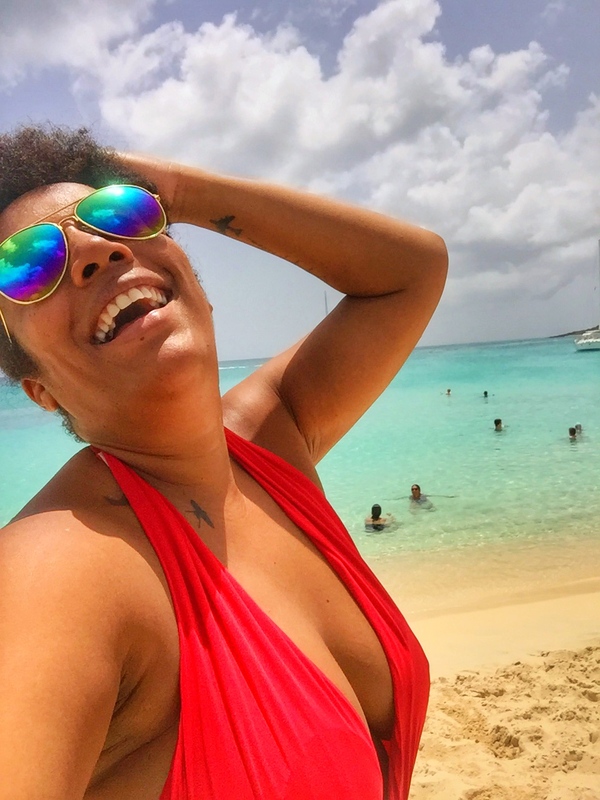 The family of four spent seven years on the friendly island before moving back to Curacao, when her dad quit working for the government to follow his dreams and started his own business. Valeska describes her early years in St. Maarten as one big smile from ear to ear. Her childhood was nothing but amazing and joyful. Valeska and her brother Kurt just after moving to St. Maarten. Back in Curaçao Valeska finished high school and moved to Miami to continue her studies in Fashion Merchandising, Communication as well as her Masters in Business. After six years in Miami it was time for her to return to more familiar land. She moved once again to St. Maarten to assist her dad who in the meantime had started Palapa Center and Marina St. Maarten, a marina and shopping center on the busy strip of Simpson Bay. Her dad never forced her to work for the family business and always left that up to his children to decide. Valeska was a little hesitant about the move at first. After all this island girl got quite used to the conveniences of living in Florida and preferred to stay there for a bit longer. Faith intervened however, and made her decision for her when a bizarre miscommunication prevented her from petitioning for the papers she needed in time. Valeska loved being back in the island lifestyle though. Her heart was after all here. Valeska realized after a while of living in the US that she had started to become dry an cold hearted. Forgetting about words like “thank you” and “please”. Island life is and always has been more personal. Six years of living in the US changed that for her. She briefly lost track of where she came from, who she was and forgot a little about her values. Though life in a big country brought easy access to arts, entertainment and a wide variety of choices, life on the islands was more intimate. When asked to name the one thing she doesn’t like about island life she says that although island life in general is mostly happy and great it can also bring the worst out of people. It is sad to see how islanders rather bring one another down instead of building each other up. As you may have gathered from the beginning of this post, Valeska considers her dad to be her biggest inspiration. Her father has always been a big part of her life and one can see the immense pride on her face when she talks about him.He was a real clown that used to call us Wicky and Wacky. You can guess which one of the two of us is Wacky. While her mom was the educator, he was the entertainer in the family. The one to embarrass her in front of her friends and laugh about it after. Sadly he passed away a little over a year ago and has left a tremendous void in Valeska’s life and heart. But she is proud to be her father’s daughter. A man that has always held his head high even in his last most painful moments. He never felt sorry for himself, even at the end. Her father’s passing also left a few unfinished projects, lots of work and a legacy that needed to carry on. Valeska accepted this new challenge in her life with fierce determination. She began traveling back and forth between St. Maarten and Curaçao, often leaving her two little boys and husband behind for days. Her proudest moment was also when she finished the next phase of her dad’s largest project, Palapa Beach Resort Curaçao. This project was her dad’s lifelong dream and to see it now to almost completion thanks to the hard work and sacrifices of Valeska, her brother and mom, makes all who know them well amazingly proud. Valeska is known to work long hours. She manages the marina in St. Maarten as well as the famous Soggy Dollar Bar owned by her and her brother. When in Curacao she runs the day to day affairs related to the many projects her dad started and at home she is a dedicated mother and wife. Yet she manages to reserve some time for a glass of wine with her closest friends. Life has thrown her many challenges but she takes them all on like the superwoman she is. Valeska, her two boys and her husband Alistair. Loyal, funny yet introvert, Valeska has grown up to become an amazingly strong woman. She is a mother, sister, daughter and friend. In her spare time she paints and does graphics, which help her keep her sanity. Her two boys, Jayden and Brandon are the joys of her life. Family has always been important to her. With the help of her mom and big brother she continues to keep her father’s legacy alive. A task that is not always easy but something tells me this island girl will be just fine. Valeska and her mom, the educator in the family. Isn’t she just wonderful? Such an inspiration really. Congrats TTIG another inspiring report. Kudos to Val, thanks for showing we can have it all.